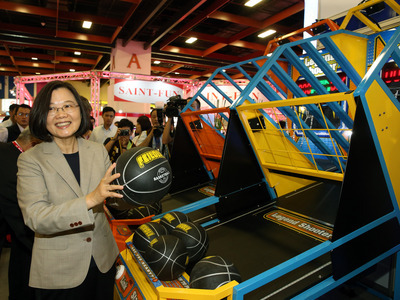 Taipei, March 18 (CNA) President Tsai Ing-wen (蔡英文) will register for the Democratic Progressive Party (DPP) primary for the 2020 presidential election before her visit to Taiwan's diplomatic allies in the Pacific which starts Thursday, the Presidential Office said Monday. Tsai will stick to her schedule and register for the primary before visiting the Pacific Ocean countries of Palau, Nauru and the Marshall Islands, according to Presidential Office spokesman Xavier Chang (張惇涵). "The president will focus on her visit to Taiwan's Pacific allies this week and speaking on behalf of Taiwan," Chang said. Tsai will first visit Palau from Thursday to Saturday and Nauru from March 24-25, before arriving in the Marshall Islands on March 26 for the first ever Pacific Women Leaders' Coalition Conference, according to the schedule released by Deputy Minister of Foreign Affairs Hsu Szu-chien (徐斯儉) last week. Meanwhile, former Premier Lai Ching-te (賴清德) registered Monday to seek the DPP nomination as its candidate in the presidential election next year. Responding to comments that his decision to contest the DPP presidential primary will cause divisions in the party, Lai said the DPP has a democratic primary process that will not be divisive.